Today I left Powell River around 10 o'clock and headed for the ferry to Sechelt. 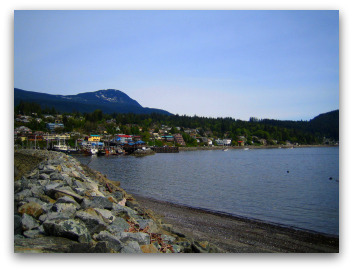 Sechelt is a small community that is situated on a sandbar, which separates the Sechelt Inlet from the Strait of Georgia. 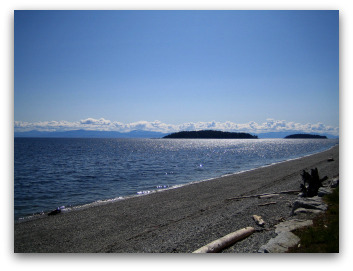 In Sechelt, I went to a beautiful beach and enjoyed the afternoon there. It was a great day for walking on the beach and enjoying the waves and the sunshine. I left at 9 o'clock today to for Saltery Bay where I was to later board the ferry for Vancouver. Not far from the ferry station was a nice little town called Gibsons (famous location of the Canadian show "The Beachcombers"). I spent a few hours on the beach and in the harbour. In the afternoon I drove to Saltery Bay and took the ferry to Vancouver. 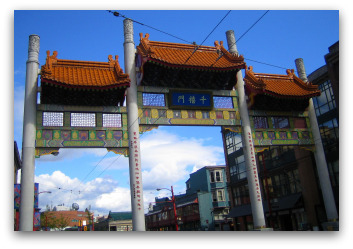 Today I drove out to Coquitlam to meet my "homestay family" where I would be staying for my time in the Vancouver area. I have some great things planned for the next few days! Vancouver is a really nice city with a lot of parks and green areas. 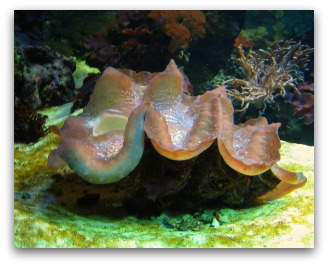 The weather wasn't very nice today so I decided to visit the Vancouver Aquarium in Stanley Park. On this particular day there were many school children there learning about ocean life. While I was there, I saw an interesting movie about the undersea world. After the aquarium I went to Gastown, a national historic site located in the northeast corner of downtown Vancouver, on the south shore of Burrard Inlet. This is really where it all began and today it is an area with attractions, activities, shopping and of course great eating. Today I took the Skytrain from Coquitlam to downtown and then took the bus to Granville Island. Imagine, an island in the middle of a city of two million people with a Public Market, many shops and restaurants as well as theatres and galleries - all in one place! It is a place where artists enjoy their crafts and entertainers live to entertain visitors to the island. It was such nice weather that I decided to take full advantage of it and walked along the sea all the way down to Science World skytrain station. If you would like to know more about Granville Island or explore it yourself with a self-guided tour, stop in at the Granville Island Information Centre, open daily 9am to 6pm. a very nice place to dine in Vancouver. 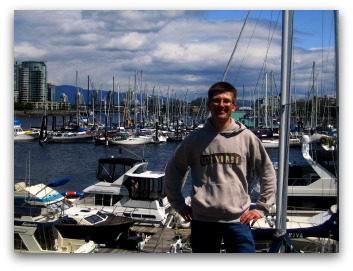 I think Vancouver is a wonderful city and I really enjoyed my time here. Around 10 o'clock, I started my next trip up to Whistler. On the way there I stopped at Shannon Falls which are south of Squamish. The falls, the third highest in British Columbia, rise 335 meters above Highways 99. 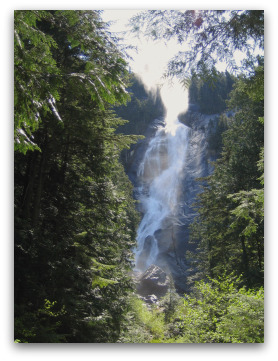 The area of Shannon Falls is held sacred by the Squamish Indians, the first people who made this place their home. My next stop was Whistler where I spent about four hours. They have many hotels and sport stores there! Whistler is hosting three competitions in the 2010 Vancouver Winter Olympics: Alpine Skiing events on Whistler Mountain; Bobsled, Luge and Skeleton events at the Sliding Centre on Blackcomb Mountain; and Nordic, Biathlon & Ski Jumping Competition events in the Callahan Valley. Later in the afternoon, I drove up to Lillooet where I stayed overnight at a BC Hydro campground right in town. There was a nice blue sky in Lillooet and I set off on my drive from Mile 0 to 150 Milehouse. 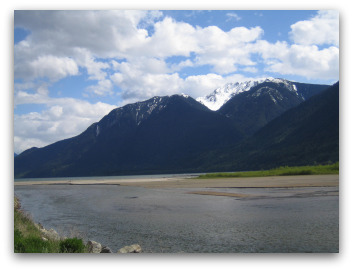 Lillooet was the largest community north of San Fransico at the time of the Goldrush in the 1860s. I made my way up to Lac La Hache over the mountains - it was so nice. Named "Lake of the Axe", after a French Canadian fur trader lost his axe in the lake while ice fishing, this community is located on Highway 97, approximately 15 miles north of 100 Mile House. From there I went onto to 150 Milehouse where I spent the night. Today I drove an hour and a half to Likely, where I wanted to do some bearwatching for the next few days with Eco-tours. Likely is a small mining and logging town in the foothills of the Cariboo District on Lake Quesnel, one of the deepest fjord lakes in the world. Likely played a large role in the Cariboo Gold Rush of 1859 as people came seeking their fortunes. There is a very large grizzly population that makes its home here. They feed on the salmon that come up the Quesnel River every year. Today I began my bearwatching adventure with Gerry at 7 am. First we drove along Caribou Lake. There we saw many signs of grizzly activity such as tracks. It was really interesting to hear what Gerry knows about bears. We stopped at a nice spot and walked into the forest. There we saw the fresh markings made by the bears on the trees. Because of the wind, the bears were no where in sight. 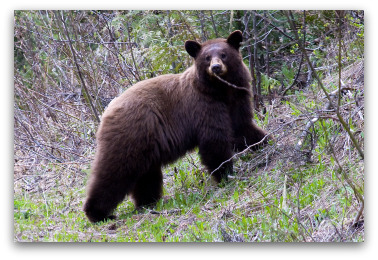 Bears can pick up a scent over 10 miles away. In the afternoon we drove about 40 km down the little river road. There we were able to spot bear and moose tracks and Jerry told us about where they like to hang out. At 5 o'clock we decided to drive back to Likely and were we lucky! We spotted a beautiful cinnamon bear, two loons and a Belted King Fisher. Jerry explained to us that a cinnamon bear is really just a really cinnamon-coloured black bear being that it belongs to the black bear family. When we got home, Peggy was waiting with a great chicken dinner with rice,carrots and a wonderful salad! What a day!